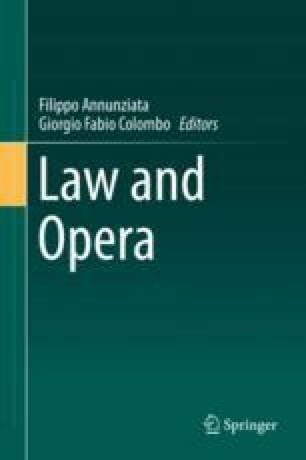 This paper deals with the conflict between legality and justice through the legal analysis of the narrative plot of the opera I due Foscari. The ancient dilemma of Socrates, heroic personification of unconditional obedience to the law, recurs in the inner drama of the Doge who is forced to convict, iuxta alligata et probata, his innocent son. In renaissance Venice, which provides the backdrop for Verdi’s music, the dialectic between law and conscience, between rules and the ethical requirement of the jurist called upon to apply the rules, assumes a tragic tone.The eternal opposition between law and justice cannot be interpreted in this context by the canons of the rebellion of Antigone to an unjust law, nor is it presented as the interpretative reformism of someone like Portia who, while recognizing the validity of the rule, uses interpretative subtleties to reverse its unfair effects: the Doge, in fact, observes the law and formal procedures, and goes as far as sacrificing his paternal feelings on the altar of reason of State. The proposed interpretation in this work, along with the examination of the problematic dimension of the relationship between truth and legal truth, revolves around the resolution of the split between natural law and positive law which passes through the wisdom of the judge, called upon—or perhaps doomed—to continually find a balance between the formal requirements of certainty and order and the substantive standards of justice and fairness.